There was something refreshing about watching former French president Nicolas Sarkozy being interrogated in a French jail. Particularly since he may soon be accused of conspiracy in the murder of my old friend, Col. Muammar Khadaffi of Libya. But three years ago, a French-Lebanese businessman told the French investigative site Mediapart that he had given suitcases with 5 million Euros (US $6.2 million) to Guéant. The former chief of staff would later claim the cash was payment for a painting he had sold to the shady Lebanese. Of course it was! In 2007, Sarkozy became president of France. At the time, he and Khadaffi appeared to be best of friends. The Libyan leader made a gala visit to Paris, pitched his Bedouin tent on the grounds of the presidential palace and received the lavish official welcome that the French do so well. France was interested in Libya’s high quality oil and using Libya as a beachhead for expanding Paris’ former influence in North Africa. France and Libya secretly colluded to fight Islamist rebels in the region who were battling French-installed puppet rulers in West and Central Africa. But then Sarkozy turned sharply against the Khadaffi regime and joined US and British efforts to overthrow it. This was not the first time. Former French president, François Mitterrand, ordered his intelligence chief, Count de Marenches, to destroy Khadaffi’s personal jet with an altitude-fused bomb. Marenches told me the bomb was secreted aboard the plane, then removed when relations with Tripoli improved. British intelligence, MI6, also tried to assassinate Khadaffi by means of a car bomb in Benghazi, Libya, but failed, though many civilians were killed. Sarkozy eventually heeded demands from Hillary Clinton, then US Secretary of State, to launch a war against ostensible ally, Khadaffi, and seize his oil riches. Warplanes and special forces from the US, France and Britain joined in a sustained attack on Libya, which was cynically misrepresented as a humanitarian rescue mission. French aircraft strafed Khadaffi’s convoy. French special forces and Libyan mercenaries caught Khadaffi, tortured him with a knife, then shot him dead. Khadaffi had made the fatal mistake of telling his eldest son, Saif al-Islam, and senior officials about his secret payment to Sarkozy. 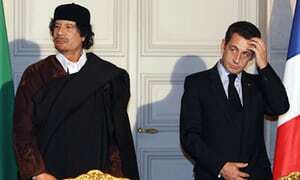 When word leaked out from Saif, Sarkozy quickly ordered the attack on Libya. Dead men tell no tales. French intelligence is very skilled at rubbing out foes and nuisances.